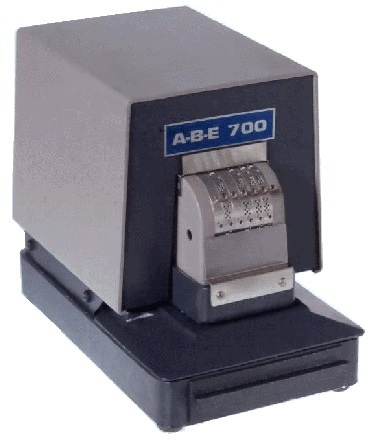 ABE 700-NC document perforator Electric Operation is for permanent and unalterable marking of documents perforated holes can not be erased.Perforating applications include: Dating - Numbering - Canceling - Receipting - Validating and Encoding. fast, convenient, easy to operate. Automatically perforates up to 20 papers per insertion. Attractively priced. Costs less the other comparable electric perforators. Wide variety of models to provide fixed and/or verbal information. 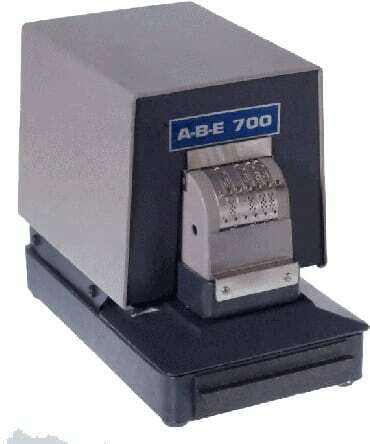 Document Numbering Perforator ABE 700-NC, with 6 number wheels (center line) and top +/or bottom lines of fixed text (5 to 7 characters each).